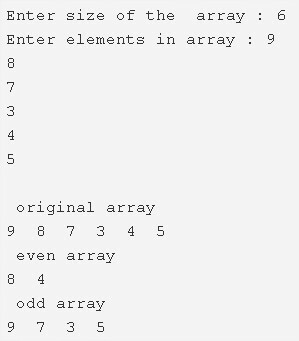 C Program to put even and odd elements of an array into two separate arrays – In this article, we will discuss the several ways to put even and odd elements of an array into two separate arrays in C programming. As the name of the title suggests, we will be having both even and odd elements in a given array. 9, 8, 7, 3, 4 and 5. Out of these, 8 and 4 are even. Rest of the lot is odd in nature. 2) The scanf(“%d”,&a[i]) reads the elements and store the elements into the array a using for loop for(i=0;i<n;i++). 3) The main() calls the print() function by passing array,array size as arguments, to print the original array. a) If the remainder of a[i]/2 is zero then a[i] is an even number and store the even number into the array b as b[j++]=a[i]. b) If the remainder of a[i]/2 is not equal to zero then a[i] is an odd number and store the odd number into the array c as c[k++]=a[i]. a) Print the b array which is having even numbers, using the function print(b,j). 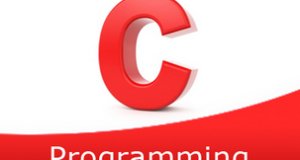 b) Print the c array which is having odd numbers, using the function print(c,k). The main() calls the function() by passing three arrays a,b,c and array size as arguments. a) If the remainder of a[i]/2 is zero then a[i] is even number and store that even number into the array b as b[j++]=a[i]. b) If remainder is not equal to zero then a[i] is odd number and store that odd number into the array c as c[k++]=a[i]. c) function() prints the even numbers by calling print(b,j) and it prints odd numbers by calling print(c,k).